Just imagine a musical experience designed to lift people’s thought to a higher sense of awareness and healing countering the downward pull of negative energies we all encounter in the world today. Is Anybody Listening? is a clarion call to the world to pay attention. Once we’ve got your attention, we take an in depth and inspiring look at how these issues can be healed spiritually by inspiring mankind to live in a higher state of consciousness. It’s a Concert and Webcast, designed as a live concert piece that premiered, Live from New York, September 22nd of 2016 and ran for 4 performances through October 4th. 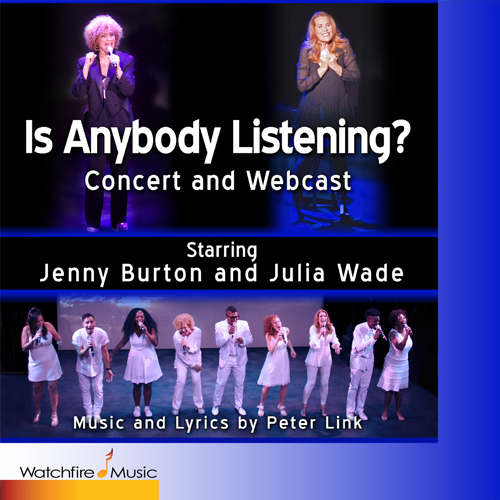 The production featured the award-winning performances of Jenny Burton and Julia Wade along with a cast of 7 top NY vocalists and the music of million selling record producer and composer, Peter Link. We videotaped the last two shows. This is the live sound track from those two performances plus a bonus song written and recorded since. Explore More About The Is Anybody Listening? Concert and Webcast here. We listen best in silence. We listen to the music! But do we hear it? Did ja’ listen when Jiminy wished upon a star? To Where The Wild Things Are? Did ja’ listen to Goodnight Moon? Or when that crazy little mouse saved that mighty lion? People do you hear me? Ya’ want us to turn it up? What have I done to deserve …? How Are We Raising Our Sons? Take just whatever he wants? Why must we bend to you? What have we done to deserve …? We look to South Africa! Rain – A shower, a deluge, a thunderstorm. From the blackness the following words appear over the Intro. The words fade to black and we hear the sounds of water slowly fading in. Again, from the blackness the following words appear. Once again, the words fade to black and now we hear the music begin — intermingling with the sounds of thunder and an approaching rain storm. Again, from the blackness the following words appear. Water is what makes our planet unique. The music rises. From the blackness the clouds begin to form. We hear more thunder mingling with the sounds of the music. Again, the following words appear. We first see beautiful visuals of the cycle of water in its pure form — first as clouds, then as rain that gathers into streams that flow to rivers that move over waterfalls and rush onward to the seas. Then the mists rise off the oceans as the sun pulls the waters back into the clouds to complete the cycle. The earth is 70% water. As seen from the beauty of the presentation, we know that this is the way it’s supposed to work — the way nature intended it to be. All of this is musically underscored. Now, pictorially we move into visuals of the multifarious uses of water in our lives. The following song plays through all this.